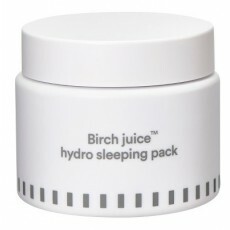 Completely replacing water as the base ingredient, this sleeping pack from Enature is enriched with 74% Birch Juice to provide intense moisture and nutnrients while you're getting your beauty sleep! Also contains chamomille and plantain seed extracts to soothe and repair skin. Apply appropriate amount at the last step of your evening routine. You can use it as a replacement of your moisturizing cream or over your moisturizer if your skin is particularly dry. Leave overnight, then rinse in the morning.